What Car? launches new mobile website | What Car? 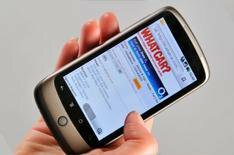 What Car?, the UKs biggest car-buying advice brand, has launched a new version of whatcar.com optimised for mobile phone users. 'What Car? mobile provides an important route for car buyers to reach our content and the response from our advertisers has been spectacularly positive. The rapid emergence of smart phones and the improved web browsing capabilities of all mobile phones means this will be an important platform for us.' Said Andrew Golby, What Car? Publishing Director. All of the content has been adapted for a mobile phone environment with bespoke page layouts and rapid delivery of each page on the handset. What Car? mobile will be especially useful to the car buyer when in car dealerships, as they can access over 400,000 car reviews covering almost ever every variant on sale in the UK today. What Car? mobile will enable car buyers to make even more informed choices.